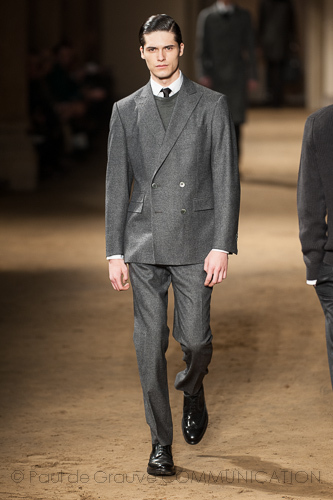 The man fashion week starts in Milan with the contemporary dandy of Corneliani collection. Luxury and elegance are accompanied themselves in an impressive runway, made so thanks also to the late-Baroque background of the Round of Besana. Very careful attention to details, Corneliani has skillfully exploited colors and materials to reproduce the dynamism characterizing our metropolis, without excesses. A sophisticated simplicity, adapted to the continuous cultural change. Everything has declined in the dominant shades of very dark blue and black mitigated by the gray and the natural colors, enlivened with moss green. The combination of materials is especial. Cashmere, jersey and mutton are used to enrich the simplicity of the garments, through which stand out coats of generous length, that shows an elongated silhouette, proportionated by crisp and short trousers. The fall/winter 2014/2015 wardrobe by Corneliani shows the experience of a tradition, beginning in 1930 and continuing until today with great skill. One of the must-have collection? A biker style jacket in crocodile nappa, which is the material also used for the hand-bags. Chiara Ferragni presenta il suo libro "The Blonde Salad"